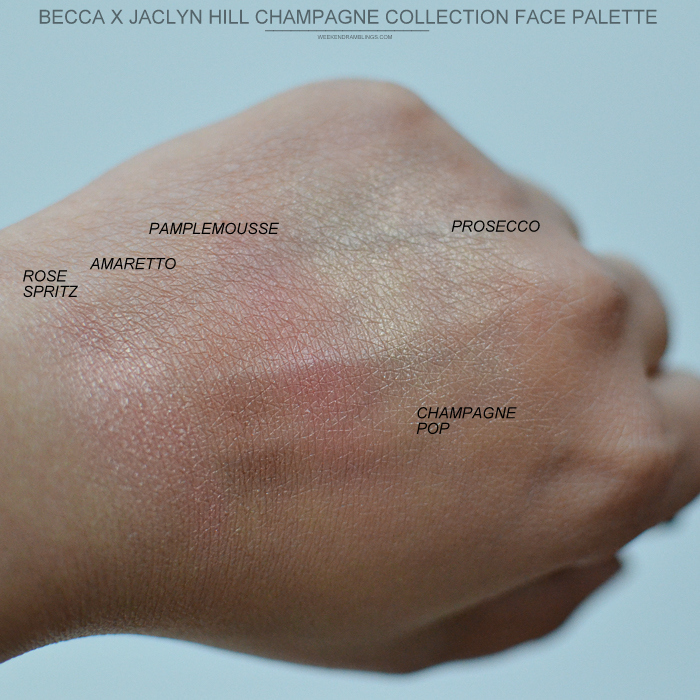 Even an under-the-rock dweller in the fringes of the makeup world would know all about the Becca - Jaclyn Hill collaboration and the much-raved-about Champagne Pop highlighter. The highlighter being such a favorite, the two teamed up for another collection, this time to include palettes with eyeshadows and blushes mixed in. I tried out the blush-highlighter palette that is still available at Sephora, and got some swatches to share. The palette has a beautiful white and gold packaging on the outside, luxurious gold inside and includes a huge mirror on one side. There are 3 blushes and 2 highlighters in the palette. 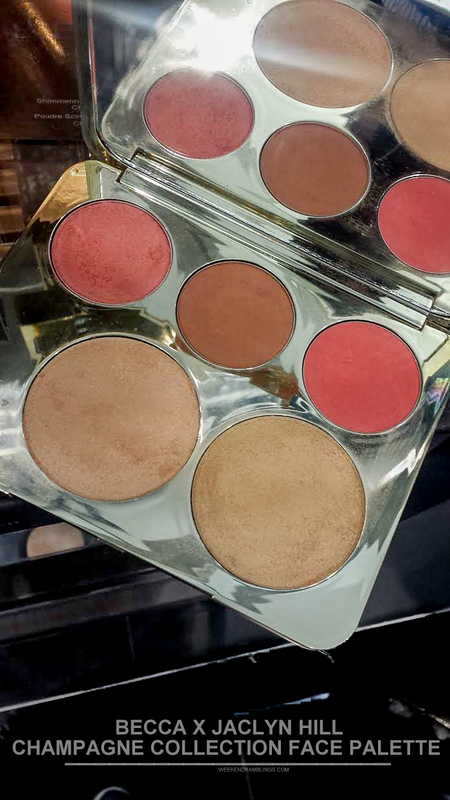 The blushes are a mix of matte (2 mineralized blushes Amaretto and Pamplemousse) and luminous blush in Rose Spritz. The two highlighters are Champagne Pop and Prosecco Pop. Scroll on for swatches. At $52, this palette is a good way to pick up a couple of Becca blushes and highlighters. There are generous quantities of all the products, and for someone like me who is yet to hit pan on anything, this palette is just right. The blushes are decently pigmented, and the colors show up quite well on my medium-dark skin tone. The colors are beautiful and seem the sort that would work for most skin tones. Just my personal preference, though, I have never really hopped on to the Champagne Pop bandwagon, and I don't feel any differently about the highlighters in this palette. Becca Liquid Highlighter in Opal remains my favorite. 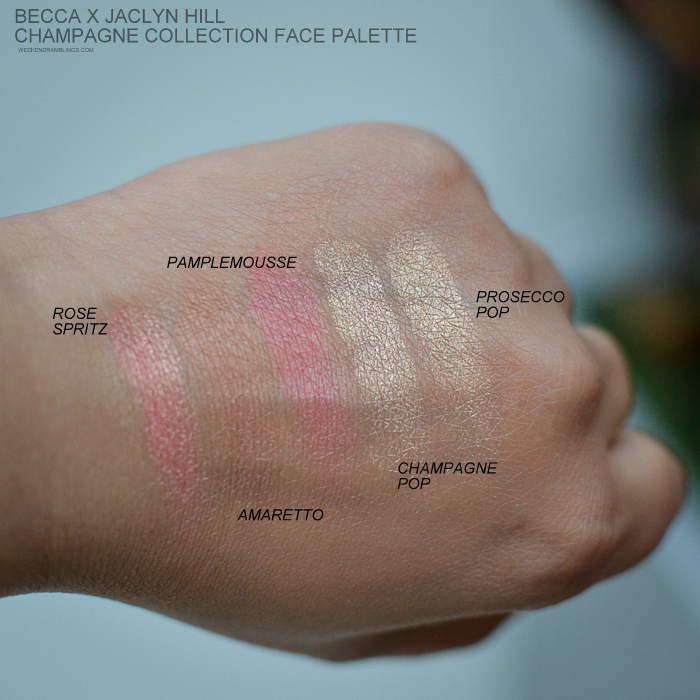 The blushes are so pretty - love the subdued shimmer in Rose Spritz - but they are similar to ones I already own, so overall, this palette isn't really a must-have for me. If you do like the colors, look out for these palettes in-store at Sephora. There are quite a few still in stock.